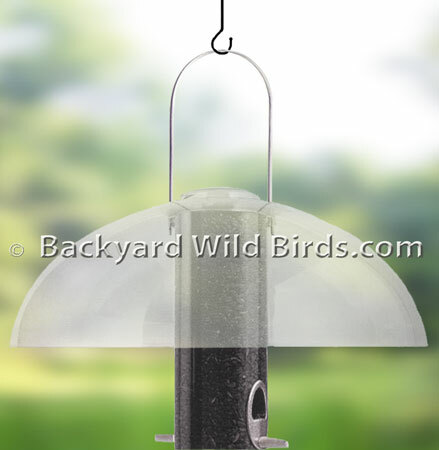 Super Tube Bird Feeder Baffle is an 18 in. 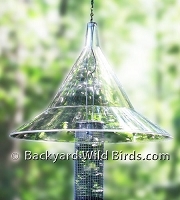 Super Tube Top that offers squirrel and weather protection for tube bird feeders. This tube Bird Feeder Baffle can be used with 2 3/4" or 4" diameter tube bird feeders to protect them from squirrels, rain and snow. With this 18 inch diameter squirrel baffles curved surface, these problems just slip slide away. 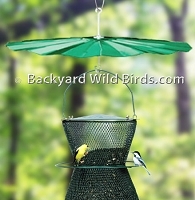 Simply slip this over the bail wire and rest it on the bird feeders cap - no hardware needed! The Dome is molded of polycarbonate, the strongest and most durable plastic available. It is UV stabilized to stay flexible and clear. Baffle carries the manufactures Lifetime Guarantee. See our 'Tube Bird Feeders' which are sold separately.